1.) At the pump - Card skimmers at gas stations are on the rise. By using your credit card instead of your debit card at the pump, you’ll have an added layer of protection against fraud. You can also choose to use cash and avoid the risk of getting skimmed altogether. 2.) At an isolated ATM - Isolated ATMs in locations with very little security and sparse foot traffic are prime targets for hackers. 3.) In an unfamiliar location - When on vacation, think before you swipe. You don’t know the area and you can’t be certain which clerks are to be trusted. You’re better off paying with a credit card or with cash so your purchases are protected against fraud. 4.) For large purchases - If you’re springing for a big-ticket item, use your credit card. It’ll offer you dispute rights in case the product doesn’t turn out as you expected. 5.) Restaurants - When you hand a restaurant server your debit card at the end of a meal, they have more than enough time to also swipe your card info! Always use your debit card with caution and look out for skimmers. Check the payment processor for anything that looks out-of-place, such as a newer keypad on an older machine or a hard-to-use slot for your card. Don’t forget to cover the pad with your hand when inputting your PIN. Stay ahead of hackers by using your debit card wisely and be sure to sign up for Ideal CU's FREE Debit Alerts to monitor your account activity. Debit Alerts allow you to set up custom alerts to be sent to your mobile phone and/or email address. You choose the alerts you want to receive and how, and can customize your alerts anytime using Ideal CU's convenient Debit Alerts Website. Here is just one testimonial of how Ideal CU's Debit Alerts saved a member from unexpected loss. “Thank goodness I signed up for Debit Alerts. One Friday night I got a text that a $300 transaction at a car repair place was authorized. Because I was notified immediately, it saved me time and stress of having to deal with disputes and financial loss.” – Stephanie W.
Peace of mind - you can't put a price on that! Shannon has worked as a teller and member service rep before landing in Marketing where her passion for credit union industry was born. 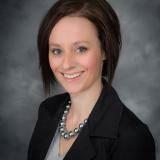 Currently, Shannon manages the Contact Center and electronic banking efforts and support. Afterhours, you can find Shannon at home with her husband and two kids spending time on Pinterest looking for new recipes and DIY home improvement ideas – neither of which come to fruition.